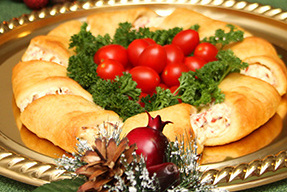 Deck the halls with holly and what-not, but save the buffet table for this glorious Christmas Wreath Appetizer made with bacon and cheesy crescent rolls. In a medium size bowl use a fork to mix together the PHILADELPHIA Cream Cheese, BREAKSTONE’S Sour Cream, OSCAR MAYER Bacon, tomatoes, and Italian seasoning. Set aside. Line a cookie sheet with aluminum foil. Unroll the crescent rolls and arrange in a circle, overlapping the crescents. Use the widest edge of the crescent roll on the inside of the circle. Leave a 3"-4" opening in the center. Use a small spoon to spread the cream cheese mixture around the base of the circle. Bring the points of the crescent roll up and over the cream cheese tucking the ends into the bottom of the roll, pinching to seal. In a small bowl, beat the egg with a fork. Use a pastry brush to lightly coat the top of the wreath with egg. Bake at 350 degrees F for 20-25 minutes or until the wreath is a nice, golden brown. Remove from oven and let cool 5 minutes. Remove from cookie tray and place on serving tray. Place tomatoes and parsley in center of wreath. Cut into small wedges when ready to serve. When you are laying out the crescent rolls be sure to overlap the edges just slightly. You'll want to leave a 3-4" circle in the center. Spread the filling only around the base of the circle. Bring the points of the crescent roll to the center and press into the bottom of the roll and pinch to seal.